Like it or not, most people will at least partially judge you based upon your physical appearance. While working out and eating healthy help, the easiest thing you can do to improve your appearance is through your wardrobe. While women learn fashion at an early age, most men pay only the barest of attention to their clothing. It’s just not perceived as very masculine. “Say, Bob”, says Hank, “what do you say after the big game we go to Hugo Boss and check out the new spring collection?” Not likely. So, most guys wear clothes that don’t give an accurate representation of who they are, and more basically don’t fit. One strike against them when they meet new people, even before they say a thing. While it’s not as important as world peace, learning a bit about fashion and dressing well is a simple way to tell others who you are, and to feel more physically confident at work and in public. Most men wear clothes that are one size too big. Personally, I used to do this when I weighed a bit too much in order to hide my stomach. The result is that I just looked frumpy – lots of extra fabric hanging off my arms and torso, sleeves that were too long, and shirts bunching where they tuck into my pants. The last is particularly unflattering. As I found out recently, it’s called “muffin top”, resembling baking muffins expanding out over the edges of the pan. Make sure you’ve got the right size in all your clothes. Note that in clothing, “size” and “fit” are often two different things. “Size” refers to the traditional meaning – in casual shirts, for instance, “small”, “medium”, “large”, etc. But more recently, “fit” has come to mean the shape of the clothing. In particular, the more “trim” the cut, the more the clothing hugs the body. For instance, “trim” shirts are somewhat tighter at the chest and waist, with smaller armholes. If you’re concerned about your spare tire pressing against your shirts, then you should still buy the correct size (no larger), but get the “traditional” or “classic” fit as opposed to the “trim” fit. And then lose that excess weight – not only will you look better, you’ll feel better, and odds are you’ll live longer. In most clothing brands, there’s also a “super trim” fit that is currently trendy. If you’ve got the body (read: flat stomach) to wear this, I think it’s fine, but understand that trends often fade. In other words, don’t fill your wardrobe with super trim unless you don’t mind replacing it all once the trend subsides. There was a senior executive at our company who was probably 50 years old. Distinguished features, slightly greying hair, and he wore hipster clothing designed for people in their 20s. He just looked silly in distressed jeans and t-shirts. I suppose he was trying to show he was in touch with the youngsters. Actually, no, I don’t know what he was trying to show. Ideally, your wardrobe should reflect the authentic you – your age, profession, interests, and your own style preferences. Think about who you are (or perhaps who you want to be today), and dress accordingly. This isn’t to say you need to start dressing like your dad once you get older. Take a look at what older men wear, and choose the subset that you like. As you embark upon this (perhaps) new world of awareness about your clothing, you’ll start donating old (large) clothes to Goodwill, and purchasing new ones. I suggest you buy quality over quantity. Good quality fabrics are generally natural materials like cotton, linen and wool. Sometimes manufacturers add a small bit of Lycra or other artificial material to help clothing maintain its shape and/or stretch, but this should be less than 15%. Anything more and it’s not going to look or feel good. Anything next to your body should feel soft and comfortable. A well-made dress shirt (for instance, from Brooks Brothers or Hugo Boss) is going to look better, feel better, so you’ll be more likely to wear it more often. Even though you could get three shirts at Target or Old Navy for the price of that one, it’s not really the bargain you’re looking for. Any man over 25 years old should probably have these wardrobe basics. These are classics – they were in style 20 years ago, and they will likely be in style in another 20 years. Stock up on these basics first, and then lightly pepper with whatever more trendy items you like. Note that the below list assumes you don’t wear a suit and tie every day to work. Here in Silicon Valley, hardly anyone does, but feel free to adjust as needed to your circumstances. One quality wool suit, either black or grey. Two-button jacket (with the bottom button always worn un-buttoned). Even if you never wear it to work, you’ll look sharp at formal dinners and parties. Navy blue sport coat – Again, two-buttons. Goes great with almost anything from dress pants to jeans, dress shirt to t-shirt. 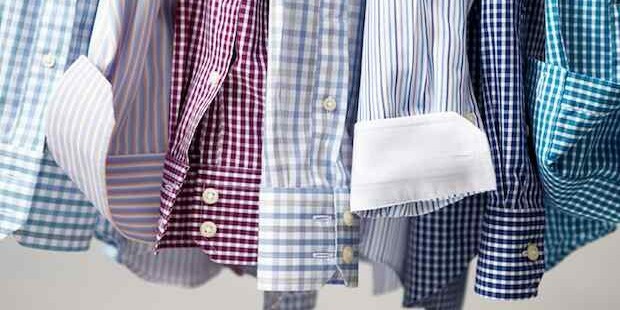 Dress shirts – Long-sleeved, button down, crisp, fitted shirts that can be worn with suit, under a sweater, with or without a tie. Buy solid white and solid blue shirts to start. Casual button-down shirts – Similar to the dress shirts, long-sleeved, not quite as crisp, sometimes with button-down collars. Can also be worn under a sweater, but not with your suit. V-Neck sweaters – Note that 100% cotton sweaters can loose their shape over time. Choose cashmere or silk/cotton blends instead. Start with a dark grey sweater because it’ll match almost anything. Follow with other solid colors such as dark brown and blue. V-necks work more comfortably over a button-down shirt, and either v-neck or crew t-shirts can be worn underneath instead for a more casual look. Black dress shoes – Classic rounded toe, lace-up dress shoes that fit comfortably. Avoid square toes and buckles, at least for this first pair. Dress pants – Either cotton or wool, flat-front pants that can be worn with button-down shirts and your blue sportcoat. Somewhere in-between your suit and the below khakis/jeans. Khakis and Chinos – Casual pants as an alternative to your jeans. Choose 100% cotton with a flat front (no pleats). Start with traditional khaki color, then dark brown and/or dark blue. Jeans – Your classic jeans should be dark blue, with no distress or tears. Watch – Select a masculine, classic analog model (save your digital watches for the gym). Choose a watch that reflects your personality and taste – thick leather bands are fine, as are metal. The first and perhaps last accessory for men. Although many people these days just use their mobile phone for the time, a high-quality watch is a great finishing touch. Your sock color should always match the color of your pants, not your shoes or anything else. The exception is blue jeans. Avoid t-shirts unless you’re at the gym or doing chores at home. Their boxy shape is simply not flattering and you’ll look like most other poorly-dressed men.